Kemlon is world renown for designing and building high pressure and high temperature downhole electrical connectors. Virtually every oilfield service company in the world uses some high pressure product designed and built at Kemlon. In addition to downhole connectors, feedthrus and penetrators, Kemlon designs and builds custom sensors for all the major oilfield service companies and many smaller companies as well. These sensors utilize our customer’s proprietary geometry and signal evaluation/interpretation software and Kemlon’s patented designs and manufacturing technologies to design and package a working sensor meeting the customer’s demanding requirements. Inspection of a many oilfield service company downhole tools will reveal the presence of these sensors. The expertise in designing these custom sensors is a natural extension of Kemlon’s high pressure, high temperature connector technology. Operating pressures of 20,000 psi and 400° F are typical. Higher values are achievable with the right configuration and technology. 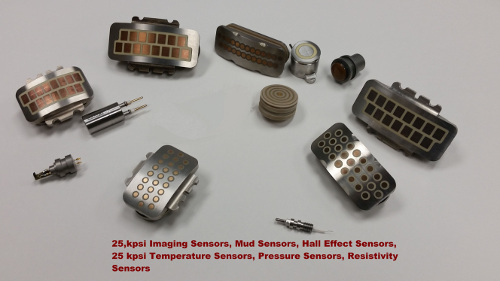 Among the Kemlon manufactured downhole sensors that might be seen on an oilfield service tool include: resistivity sensors, acoustic sensors, mud sensors, imaging sensors, temperature sensors, pressure sensors, and inductive sensors. Our design team is made up of degreed engineers in electrical, electronic, computer, mechanical, chemical, and aerospace engineering. They have at their disposal a large and diversified in-house manufacturing capability that includes CNC machining, electron beam and laser welding, rubber molding, hermetic glass-sealing for high pressure, injection molding, and gold plating. We design and build all molds and compound proprietary rubbers for the various downhole environments. See our capabilities link.